Our deepest sympathies on the loss of Chewy. I know this is very late, but I've just been on the website today due to our friend passing away on 12/8 whose arrangements are pending with this facility. 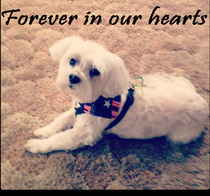 The loss of a pet member of a family is very heartbreaking.